Home »Posts Tagged "Rock Stars"
What are the commons among Jimi Hendrix, Janis Joplin, Jim Morrison, Kurt Cobain and Amy Winehouse ? No guess! 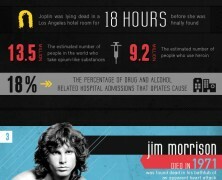 Drug and alcohol abuse that resulted in premature death. These rockers belong to the so called 27 club – a group of music’s deceased elite, consisting of prominent musicians who kicked the bucket at the age of 27. Great interactive mapping representing the Rolling Stones legendary concerts’ route around the globe throughout their 50 year history.